World café style discussion to allow participants to discuss and debate about what a strategic, long-term vision of a Scotland without poverty would mean to them. The world café starts at 11.45 on Monday the 28th in Pollock Halls, University of Edinburgh. If you’re not there you can follow the discussions live via Twitter on @PovertyAlliance and the hashtag #PovertyAssembly. 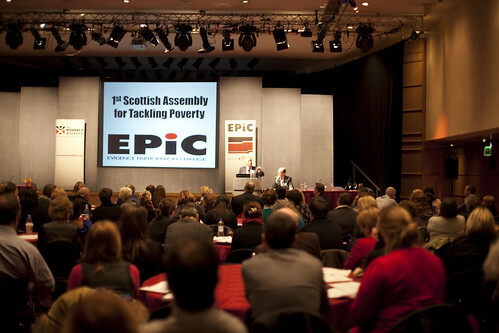 The first event of this year’s Poverty Assembly will be the open plenary where we have none other than first minister Alex Salmond joining us (still tbc) together with Louise Allan from Fife Gingerbread and Martin Boyle from Scottish Drugs Forum. Jim McCormick will chair. The plenary starts at 10.15 on Monday the 28th in Pollock Halls, University of Edinburgh. Attendees will be invited based on their knowledge or experience across the six themes and their involvement at previous Assemblies. It is intended that the Scottish Assembly is more than just an annual conference, but is about deepening our understanding of poverty over the longer term, identifying lasting solutions and promoting dialogue regarding the implementation of those solutions. The Assembly will take place over two days and use evidence sessions on each theme to consider underlying causes of poverty in Scotland and agree what needs to be done to move towards a Scotland without poverty. Participants will follow one theme through the three evidence sessions, discussing and debating the problems and the solutions, and finally identifying key priorities.